Close this boxClose and don't open this box next time! Lukáš Parízek: We must do more to detect and suppress terrorist financing channels. We need to develop more effective ways to prevent and counter the misuse of the Internet by terrorists while respecting fundamental rights and freedoms. Natalya Drozd, Head of the OSCE Centre in Ashgabat: There is a great potential for continuing and strengthening our important dialogue based on trust and co-operation. Lajčák: Constructive dialogue and concrete, small steps in confidence-building are needed to keep the positive momentum in the Transdniestrian settlement process. OSCE and Biometrics Institute partner to help States explore benefits and potential of biometric technology in countering terrorism, and how to responsibly use and share collected biometric data. The meeting highlighted contemporary approaches and promising practices to use technology to support victims and break the vicious cycle of human trafficking. Gísladóttir: It is unacceptable that Roma and Sinti continue to face hate-motivated attacks and violence. Engaging relevant government authorities and the private sector – strengthening dialogue – is the path to take. Strengthening co-operation among states and fostering partnerships between governments and civil society are key to countering terrorism and preventing violent extremism, said the opening speakers. Roma are one of the groups most affected by statelessness. The OSCE ODIHR and the UN Refugee Agency are working together to find a solution to this unique challenge. The OSCE has developed an intelligence-led policing model, designed to help law enforcement services work together to share data. The model insures that rigorous safeguards and independent oversight are in place to uphold international and national law. During his visit he discussed the social, economic and security concerns on the ground. He also saw first-hand the everyday work of SMM teams in the field. The OSCE High Commissioner’s thematic Recommendations and Guidelines cover the most relevant and sensitive policy areas related to national minority issues. The OSCE stands for the Organization for Security and Co-operation in Europe. With 57 States from Europe, Central Asia and North America, the OSCE is the world's largest regional security organization. Our activities cover a wide range of security issues such as conflict prevention to fostering economic development, ensuring the sustainable use of natural resources & promoting the full respect of human rights and fundamental freedoms. 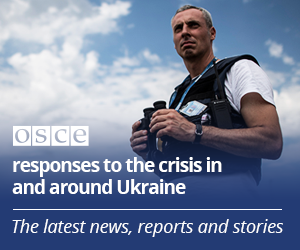 The OSCE has field presences in South-Eastern Europe, Eastern Europe, the South Caucasus and Central Asia.